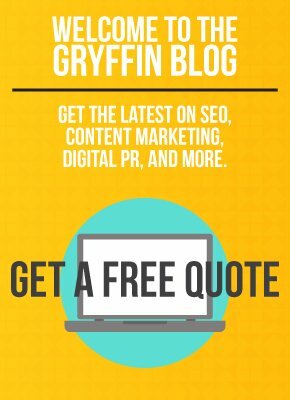 What are the best practices to keep in mind when optimizing blog content for SEO? You’ve probably heard a lot of conflicting advice. In this article, we’ll go through on-page SEO best practices for optimizing blog content. This will guarantee that you are hedging your bets for on-page relevance. Whether you write for your own blog, or have an editor, all your content should revolve around unique keywords. Ideally, you’ll have received a keyword with your content brief that you will be asked to consider the focus of the article. We’ll talk more about each of these elements in the sections below. You should also identify two to three supporting keywords that will be used throughout the post, in subheadings, and even in your title. These are semantically relevant keywords that support the context of the primary keyword. How do you find these supporting keywords? We recommend Infinite Suggest . . . Simply enter the main keyword and a long list of supporting keywords will pop up . 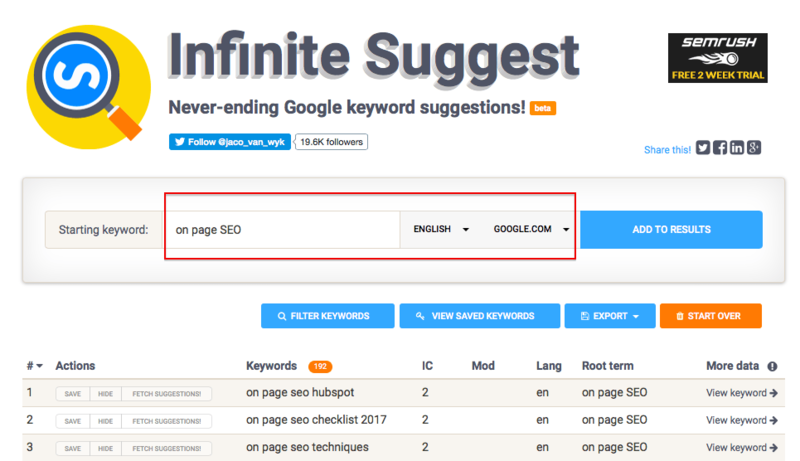 . .
You can also find other supporting keyword ideas using MOZ, Google Keyword Planner, MOZ Toolbar, and SEMrush. 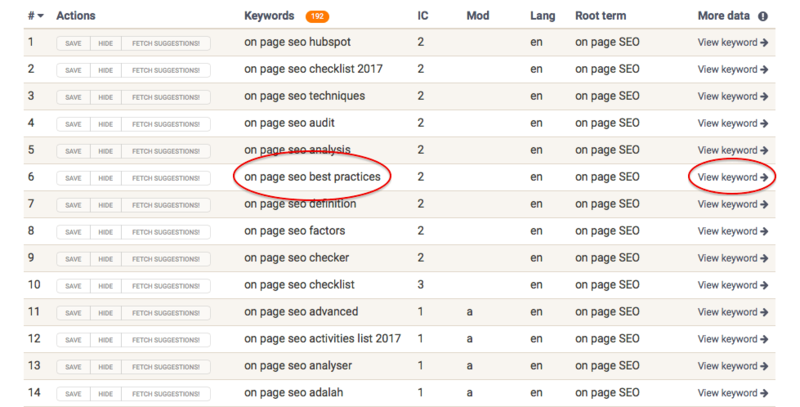 From your Infinite Suggest list of supporting keywords, let’s say you choose “on page SEO best practices” as a supporting keyword. 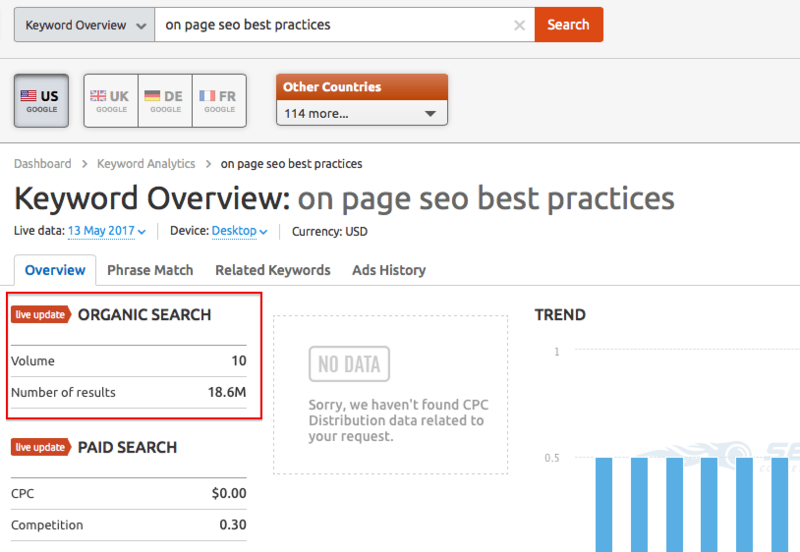 You click “view keyword” and you will see results via SEMrush. You will notice that the volume is low. What to do? Check another platform like MOZ keyword tool perhaps? MOZ says there is no SERP data. The difficulty and opportunity is not the best either. This tells you that a different supporting keyword may be better. Remember, you want to choose keywords that your audience is actually searching for. And sprinkling in LSI keywords as support is a great SEO tactic. You may be asking yourself, “What are LSI keywords?” LSI keywords, better known as “Latent Semantic Indexing” keywords, refer to the relationships between terms and concepts. 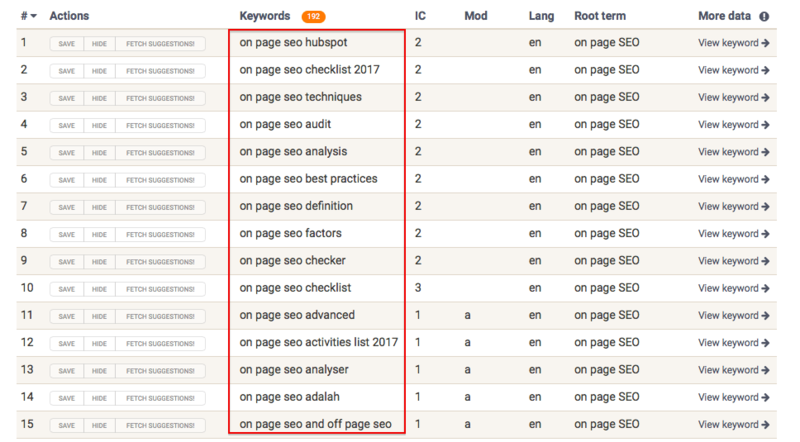 These supporting keywords help give context to the root/target keyword. It helps to provide additional long tail terms for your pages to rank for, and to establish relevance. How do you find LSI keywords? Once way is to use Google itself to provide additional ideas. Open up Google.com and search for your main keyword . . .
Then scroll to the bottom of the page where you’ll find a list of related questions that people search for. These are used for featured snippets, but they also help you to know what type of content can be used to support your primary keyword. Next is qualifying the long-tail keywords you want to use. It is best practice to use two or three of these in your blog article. Toss one or two of these into your post, but don’t sacrifice content quality! Finding and qualifying your keywords is quite often the most difficult aspect of on-page SEO for blog articles. But once you have them, things begin to fall perfectly in place. 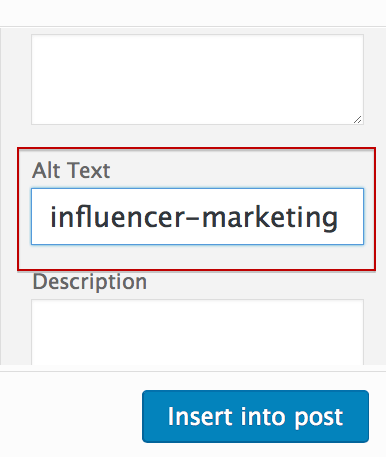 Placing keywords in your title (title tag) is important. It essentially tells Google that you want to rank for this or that. 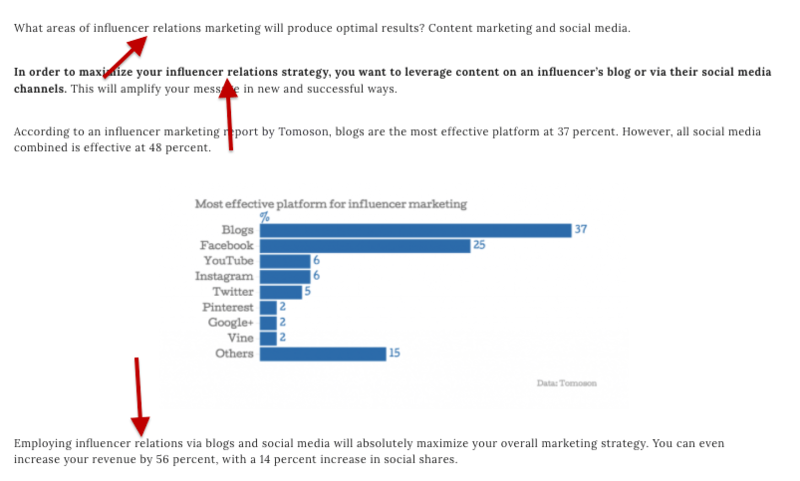 If “Blogger Outreach” is your keyword, you’ll want to include it in the title, and as close to the beginning as possible. It is important to note that you want your title to still sound natural, so don’t force it. Be natural, but always think Google page one. The closer your keyword is to the front, the more weight it carries. Modifiers are great for helping your content rank for long tail keywords. It is also a natural way to spice of your title without using fluffy adjectives. A few Google friendly modifiers include . . .
How can you use them? Try something like . . .
By adding these qualifiers, you can improve the CTR of your listings in the SERP’s. Increased CTR improves rankings. Write your titles as if you were writing ads to draw the clicks! Most CMS’s will automatically place an H1 tag on your title. does this nicely! Whether you are writing directly on , or using Google Docs or Word to create content, use their built in features for Header tags. Make sure each heading is tagged correctly . . .
We already covered placing keywords in your title. You should also be placing keywords in your subheadings as well. Generally, having your keywords in at least one subheading is optimal. 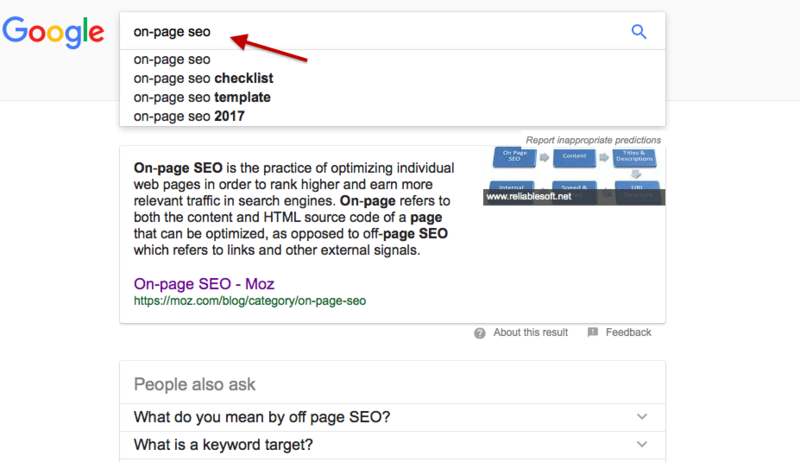 Another powerful on-page SEO tactic is to have your keywords in the first 100 words of your blog article’s body. Why? This helps to support topical relevance and gives Google strong signals that this page is about the target keywords that you are writing about. Use actionable images to support your content, and make sure each of your images is optimized for on-page SEO too. 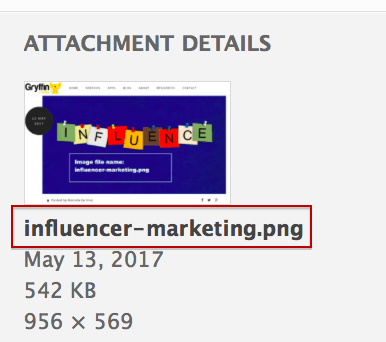 You want to ensure that at least one image file has the target keyword. It is also important to optimize your images Alt Text for that keyword. This is just another clue for Google to pick up on. This white hat on-page SEO strategy is an important one, and easy to do. By placing relevant outbound links in your content, you are telling Google more about your topic. You are also conveying confidence to search engines that your blog article is a hub for quality information. It’s important that you cite sources to relevant authorities and that your site is connected to other authoritative sites. Many know the power of internal links. However, many writers still forget to employ this on-page SEO practice consistently. They can be in anchor text . 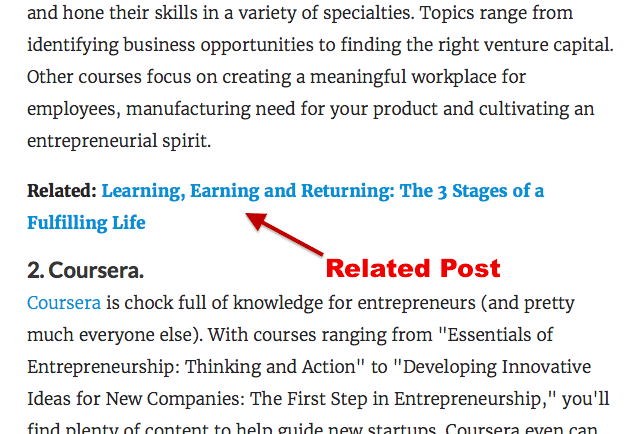 . .
Or they can be used in “Related” titles spaced out in your article. You should aim for one to two internal links per blog article to other relevant pages on your blog. 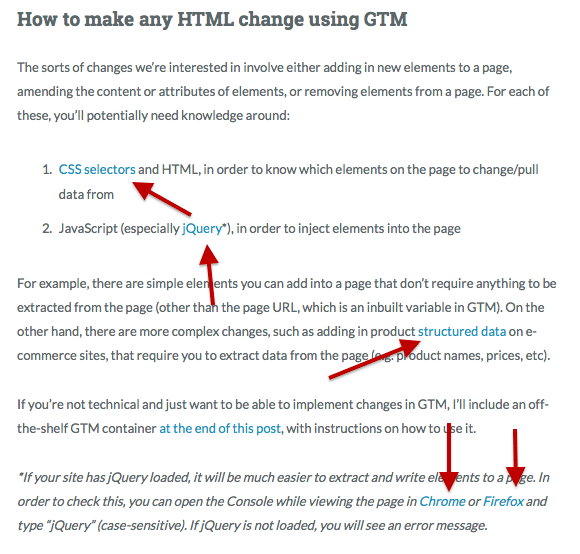 While we are on the matter of outbound and internal links, it is important how you anchor those links. 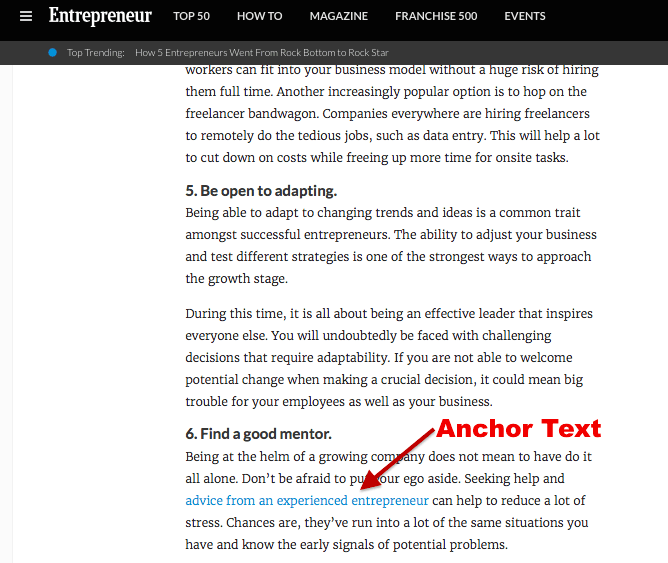 To optimize your blog article for on-page SEO, your anchor text should be relevant to the target page (the page it’s linking to). SEO and Google friendly anchor text includes . . .
Anchor text essentially tells search engines and users what information they will get if they click on a link. Having a nice balance of content to keywords is another vital on-page SEO factor. As outlined above, you want your keywords in your title, first 100 words of your blog article, and in subheadings. But you also want to spread them throughout as well. The key, however, is to think of visitors first. You should use your target keywords and support that keywords with relevant terms, but don’t overdo it! Keyword density as an SEO element is a total myth, and hasn’t been factored into the algorithm for years and years. Don’t worry about getting the density of each keyword, or being that granular. Simply make sure you add the keyword in the elements above, and most importantly, that adding the keywords reads NATURAL! 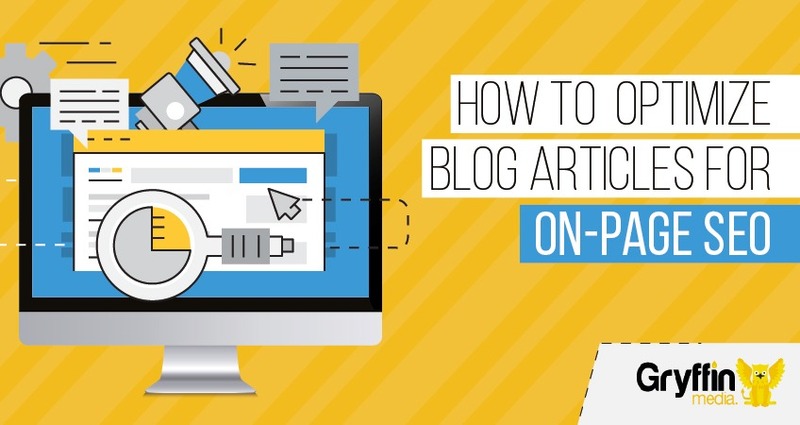 There are a number of ways you can optimize your blog article for on-page SEO. If you want to increase traffic by ranking page one, improve time on page and bounce rate, and lead your audience farther down the buyer funnel, follow these optimization tips closely.